Let me ask you this: would you ever show up to a new client interview or meeting unprepared for any questions that might be thrown at you? I bet you’re shaking your head no. So, why “show up,” so to speak, on your sales page unprepared to combat your potential customer’s objections? You wouldn’t. And, if you did, you’d force them to leave the page to scout out answers to their own questions. No bueno. Why? Because one, they don’t have time for that (even if they have nothing but good intentions to handle things on their own). And, two, that’s just asking for you to lose them to a competitor that has their crap together. Thus, they’re gone for-ev-er. What I’m getting to is, you need to amp up your objection handling skills. No, I’m not talking “sleazy car salesman” type of skills. I’m talking really, truly understanding who your ideal customer is and considering the kinds of objections they might bring to the table when it comes to your product or service. But, how can you do that in the right way when the majority of your time isn’t spent in front of your ideal people? Instead, you have a sales page acting as the go-between. Well, you better weave the right information into your copy to help alleviate or eliminate those concerns. The problem with that, however, boils down to being in-the-know on the typical sales objections so you can actually conquer them with your sales copy. For that reason, I’m here today to lay four of the most common objections out on the line for you, along with tips on how to address them with killer copywriting. Ah, the infamous sticker shock. No matter how much your ideal customer needs your product or service, if you require them to hand over a considerable chunk of change in return for a solution to solve their biggest headaches, they’re bound to object. And, not just because they perceive the price to be a bit high for their liking. But, also because they might perceive your offering to be too advanced or complicated for them to handle. Don’t worry; this isn’t anything new. It happens to entrepreneurs and marketers like you and me all the time. Instead of focusing on the investment (aka the steep price, or what may seem like it to your people), focus on the value your product or service brings to the table. Dish out a free bonus that’s of high-perceived value to serve as your differentiator, setting you apart from a sea of wannabes. If you’re wondering what your options are when it comes to bonuses, check out this post where we list out our favorites. There’s one thing we know for sure: we’re all freaking busy. As an entrepreneur looking to grow your business, it can sometimes seem as if you’re treading water for hours just to stay afloat on your ever-expanding list of to-dos. Therefore, if your product or service requires some level of commitment on their part to reap the full benefits of your offer, you’ve got some explaining to do. The last thing they need (or want) is to be forced to add yet another task to their list that takes up more of their precious time. If you want to be more persuasive in your copy to overcome this objection, focus on implementing a winning technique called future pacing. It’s all about helping your audience visualize a new future as a result of grabbing hold of your product or service. You know, one where they’re not beating their head against a wall as they fight their biggest headache in their business. Notice, instead of focusing on four hours a week, I broke the time up into manageable chunks to help the potential customer feel less overwhelmed by the required time commitment. Taking the example above to build out copy that applies to your offering will make it so much easier for you to overcome this tricky objection! Claiming you can help your ideal customers overcome their biggest hurdle is just that, a claim—especially when you’re not well known just yet in the industry you’re serving. In today’s world where anyone can be anything they say they are on the wonderful world wide web, buyers are much more cautious to hand over their wallet. They need to know you can be trusted—not just as a business owner, but also as someone who can get them to where they want to be. Otherwise, they’ll move onto the next person who can prove they’re worth. If you want to get your prospects to believe in you, you need to utilize two things: testimonials and a guarantee. The former—testimonials—will serve as social proof that your product or service will, in fact, do what you say it will. After all, it’s human instinct that if someone else is doing something—buying a product, using a service, signing up for a newsletter, jumping out of a plane—then it must be the right thing to do. Your service—this works best for service industries, of course. For example, hotels and hotel booking sites. Two factors can play a role in your ideal customer dishing out this specific objection: fear of change and/or complacency. If they’ve been doing business for a long time, chances are, they’re going to dread the thought of altering anything. Change is outside of their comfort zone. And, related to that, they may feel their biggest problem you’re trying to help solve is manageable. They’re “okay” with continuing on the same path. Hey, they’ve been doing it for a while now, anyway. Yikes. They’re putting up a good fight against your offer, aren’t they? Use your audience’s biggest headaches to create frustration. For example, is your target mostly fed up with the lack of time they have to dedicate towards what they truly love to do in their business? Don’t be afraid to call attention to that. Use your personal story to create sadness (and, in turn, build inspiration). Prove you understand exactly where your audience is coming from and their feelings of frustration at this point. Again, you’re establishing a connection with your people! Use your product or service details to create happiness. Will it save them time? Money? Free them from fear, worry, or stress? Whatever it is, put it in the spotlight to help them paint a happier future with your offering. Use FOMO (or scarcity) to create fear. Limit the time or the quantity of the offer. Or, simply limit the offer as it stands (ex. The extras—free support/installation/shipping, the price, and so on). Well, there you have it. 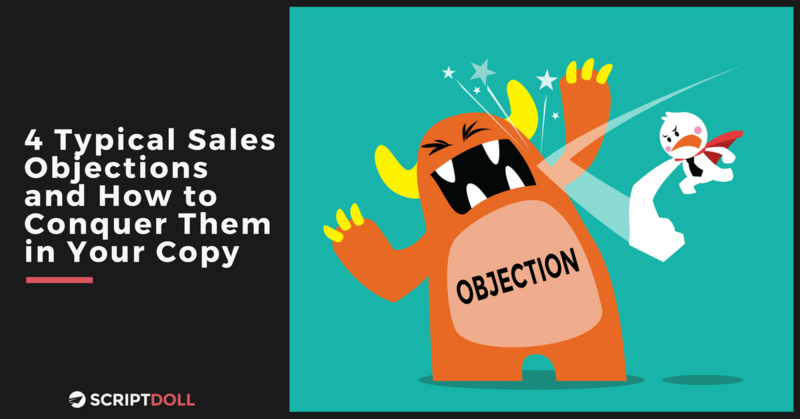 The four typical sales objections and how to conquer them in your copy. As soon as you start addressing these in your marketing pieces, you’ll find it so much easier to grab hold of those coveted sales you’ve been after. And, I’ll leave you with this: getting those sales involves a lot of hard work on your end. To be truthful, you need so much more in your arsenal than what was shared here today. That’s why we’re offering you our FREE eBook: “Pack on the Sizzle in Your Copy: How to Create Features and Benefits, Bonuses, and Induce FOMO to Devour Serious Sales,” delivered straight to your inbox. All that’s required to get your hands on it is your email. Just drop it into the box to the right-hand side of this page, and you’re all set! We want to know: which objection do you feel you need to conquer the most? Drop us a line in the comments section below!